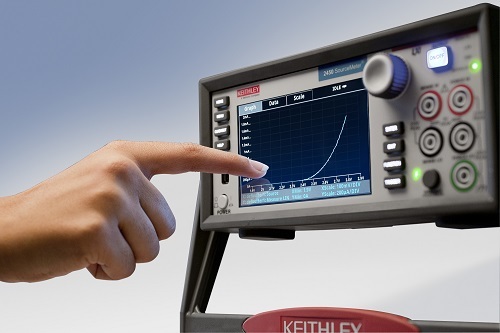 The 2650 Series High Power SourceMeter SMU Instruments are designed specifically for characterizing and testing high voltage/current electronics and power semiconductors, such as diodes, FETs, and IGBTs, high brightness LEDs, DC-DC converters, batteries, solar cells, and other high power materials, components, modules, and subassemblies. They deliver unprecedented power, precision, speed, flexibility, and ease of use to improve productivity in R&D, production test, and reliability environments. Two instruments are available offering up to 3000V or up to 2000W of pulse current power. Highly flexible, four-quadrant voltage and current source/load coupled with precision voltage and current meters Offers best-in-class performance with 6½-digit resolution. Source or sink (2651A) up to 2,000W of pulsed power (±40V, ±50A) or up to 200W of DC power (±[email protected]±20A, ±[email protected]±10A, ±[email protected]±5A); easily connect two units (in series or parallel) to create solutions up to ±100A or ±80V Supports characterization/testing of power semiconductors, HBLEDs, optical devices, solar cells, and GaN, SiC, and other compound materials and devices. Applications include semiconductor junction temperature characterization; high speed, high precision digitization; electromigration studies; and high current, high power device testing. Source or sink (2657A) up to 180W of DC or pulsed power (±[email protected], ±[email protected]) Provides the high voltage required for power semiconductor device characterization and testing, including GaN, SiC, and other compound materials and devices, breakdown and leakage testing to 3kV, and characterization of sub-millisecond transients. Built-in web browser based software Allows for remote control through any browser, on any computer, from anywhere in the world. Choice of digitizing or integrating measurement modes Supports characterizing transient and steady-state behavior precisely, including rapidly changing thermal effects. TSP (Test Script Processing) technology Allows easy system integration with Model 2657A and Series 2600B models. TSP-Link channel expansion bus Enables multiple 2651As and 2657As and selected Series 2600B SMU instruments to be combined to form an integrated system with up to 32 channels. Compatible with Model 8010 High Power Device Test Fixture and Model 8020 High Power Interface Panel Provides safe and easy connections for testing high power devices at either the packaged part or wafer level. Free Test Script Builder software tool Helps you create, modify, debug, and store TSP test scripts. Optional ACS Basic semiconductor component characterization software Maximizes productivity when performing packaged part characterization during development, quality verification, or failure analysis. Keithley Care plans provide fast, high-quality services at a fraction of the cost of on-demand service events. You are one click or phone call away from obtaining repair coverage - no quotes, purchase orders, or approval delays. In our webinar we look at ten common applications, from LEDs and Laser Diodes to measuring power efficiency of power management ICs and solar cells. This zip file contains version 1.1.8 of Series 2650A firmware and release notes. Can two Model 2657A be placed in parallel to gain higher current? This document lists the parts that are supplied with each Parametric Curve Tracer (PCT) configuration. Questions: Call our expert team five days a week, M-F.
Request technical support, sales contacts or product quotes.